The reason two-thirds of the world is water! Every day, more and more people are discovering the inclusive pleasures of a cruise vacation. More singles, families, couples, honeymooners, family reunions and groups of friends are sailing away on the vacation of their lives. Last year alone nearly twenty-five million people enjoyed a cruise vacation. When you add it all up, it’s easy to see why. The price of your ticket includes your stateroom, your meals and snacks on-board; on-board activities, parties and entertainment; plus, an exciting voyage to some of the most provocative and culturally-enriching places in the world. You’ll find that a cruise ship is like a floating resort, with all the amenities a fine resort has to offer and more. 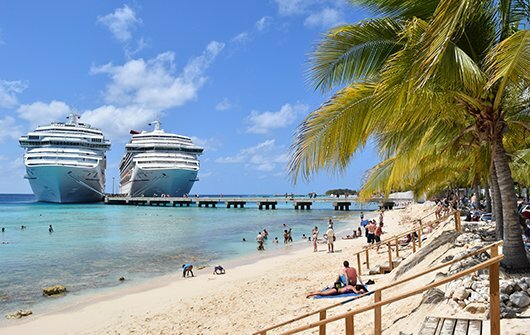 A cruise is one convenient package. You don’t have to worry about packing or unpacking or running to make flight connections as you travel from one destination to another. You can lie back and be completely pampered. Or, go non-stop. Dine like never before. Enjoy one great show after another. Let your cares float away! It’s no wonder that more people are taking cruise vacations than ever before. And once they get a taste of cruising, they come back again and again.